AORN, the CDC, the American College of Surgeons, and the American Academy of Orthopedic Surgeons recommend double gloving during invasive procedures. 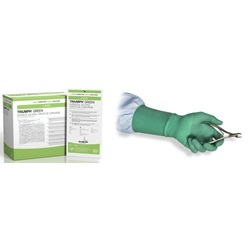 Triumph Green latex powder-free surgical gloves are ideal when double gloving with Aloetouch Natural, Triumph, or Triumph LT. Made from low-protein natural rubber latex with synthetic polymer coating. Dark green-colored gloves with a smooth surface coated in aloe and polymer. Each glove has beaded cuffs and is intended for single use. 12" in length with a 8.5mm fingertip thickness. Manufactured by Medline. Sold 50 pairs per box.